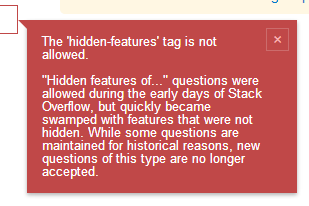 Questions asking for hidden features of languages are off-topic on Stack Overflow, and that's fine as I am not here to question that. What I am interested in is the hidden-features tag itself. While (all) questions still tagged with it are locked you can easily find them through google, but when using the internal Stack Overflow search box with [hidden-features] as the search query, it returns 0 questions. Can anyone explain why the search box shows 0 as a result? How should I interpret this? Is it a bug or is this done on purpose? 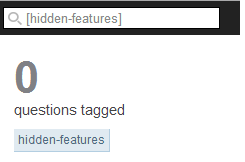 Additionally, since the internal search box does not allow us to see questions tagged with hidden-features but I think we are still able to tag our questions with hidden-features tag do you think hidden-features tag should be removed from the site? Dennis Meng is spot on, the questions you find with Google have historical locks on them. From What is a historical lock, and what is it used for? Historically-locked questions are omitted from normal question lists (those on the home page, /questions, and the various per-tag lists), but can still be found by searching for words in the post or title (via either site-search or Google, etc). Indeed, if you search for Hidden Features of C# you will find Hidden Features of C#?, which is tagged with hidden-features but also has a historical lock. Given these questions cannot be edited, this serves to preserve the categorization of those in the archives while discouraging folks from posting new ones. Was the [hidden-features] tag “unblacklisted”? Shouldn't I ask a hidden features question? Channels/Teams tags won't always correlate to SO tags - what do we do? Only SQL queries need [query-optimization]?